Arizona barrel cactus (Ferocactus wislizeni) is commonly known as fish hook barrel cactus, an appropriate moniker due to the formidable hook-like spines that cover the cactus. This impressive cactus is also known as compass barrel or candy barrel. Native to deserts of the American Southwest and Mexico, Arizona barrel cactus is suitable for growing in USDA plant hardiness zones 9 through 12. Read on and learn how to grow an Arizona barrel cactus. 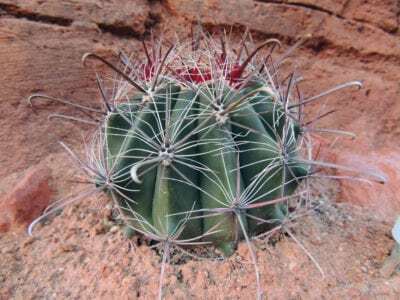 Fishhook cactus displays thick, leathery, green skin with prominent ridges. Cup-shaped yellow or red flowers with reddish centers appear in a ring around the top of the cactus in spring or late summer, followed by yellow, pineapple-like berries. Arizona barrel cactus commonly lives 50 years, and in some cases, may survive for up to 130 years. The cactus often leans towards the southwest, and older cacti may eventually fall over if not supported. Although Arizona barrel cactus can reach heights of more than 10 feet (3 m.), it generally tops out at 4 to 6 feet (1 to 1.5 m.) tall. Due to the high demand for authentic desert landscaping, this beautiful and unique cactus is often rustled, illegally removed from its natural home. 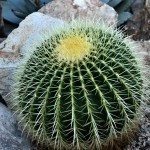 Purchase Arizona barrel cactus only at a reliable nursery. Beware of questionable sources, as the plant is often sold on the black market. Plant Arizona barrel cactus in early spring. Don’t be concerned if the roots are a little dry and shriveled; this is normal. 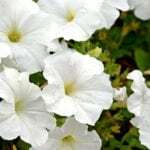 Before planting, amend the soil with generous amounts of pumice, sand or compost. Water well after planting. Thereafter, Arizona barrel cactus needs supplemental irrigation only occasionally during extremely hot, dry weather. Although is grows in non-freezing climates, this barrel cactus is somewhat drought tolerant. Surround the cactus with a mulch of fine pebbles or gravel. Withhold water completely during the winter months; Arizona barrel cactus needs a dormant period. Arizona barrel cactus requires no fertilizer.